"It took some tricky stereochemistry to build this system. 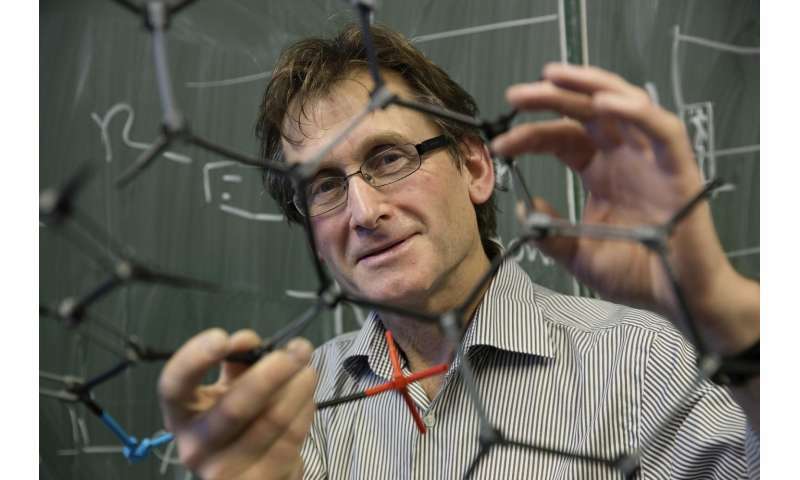 I think we've spent four or five years working on it", says Feringa, who was one of recipients of the 2016 Nobel Prize for Chemistry for his pioneering work on molecular motors. "But we have now taken a fundamental step in the development of molecular machines: the synchronization of movement." During the four steps it takes the motor to make one full revolution, the naphthalene rotor is limited in its movement by the rest of the molecule. This is how the two movements are coupled. "We had to carefully strike a balance between limiting the movement of the rotor, while allowing it to change its position." The team designed and built two versions, in which the rotor was either pointing inwards or outwards, and was pushed or pulled by the motor. By locking two moving parts, the Feringa group has taken another step towards building molecular machines. "In biology, you see many of these systems where molecules are connected in a cog-like manner, which can synchronize or amplify movement. As far as I'm aware, this has never been done in artificial systems like our own." The system which the Feringa group describes in Science has no practical application. "But we have now shown it is possible to transmit movement", says Feringa. "Like how we built our first molecular car six years ago to show that it is possible to use the revolving motion of our molecular motor to create directional movement on a surface."